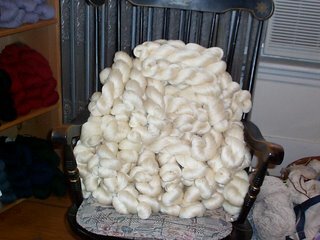 I can’t believe I got through all that yarn by myself! Usually, Kerry, my trusty minion and Queen of All Orange, plays hookie and helps me out. Unfortunately, young Kerry is busy moving into her newly painted house and, though the allure of sock yarn is great, was not able to join me. 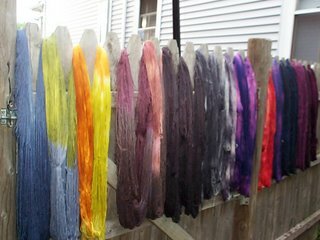 I’ve been dyeing yarn since 9am and, as my mother likes to say (warning, Mommism coming up) “I’ve died and I’m too dumb to lie down.” Which is, of course, why I’m sitting here at the computer blogging. I think I’m going to sign off now, though. 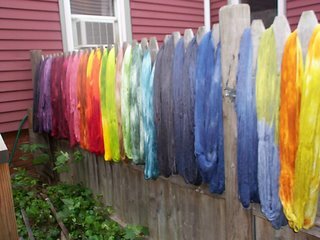 I have a bunch of pictures and will do a full dye day round up tomorrow. 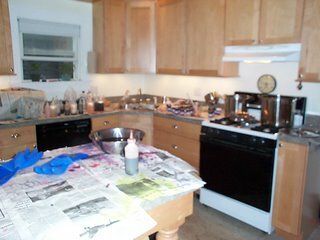 Even though I got all the yarn dyed, my kitchen still pretty much looks like this. I think I’ll order pizza and deal with it in the morning. Whoa. Good thing it finally stopped raining! I know. Can you imagine me trying to find enough places to hang that all up in the house? WOW! It makes me want to try to knit socks! Can't wait to be able to come by and see it for real!